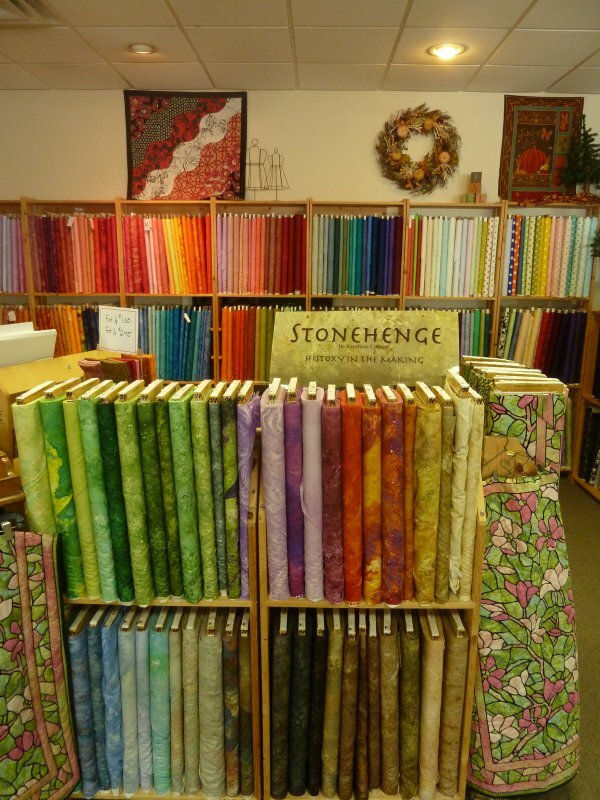 Sarasota quilts, custom quilts, T-shirt quilts, and fabric at Alma Sue's Quilts. Above are two pieces recently finished in the Hand Quilting frame. A Boston Red Sox Tee Shirt Quilt at the top. Directly above is a memory piece custom made for a Penn State Alumnus. To see your memory pieces constructed into a quilt, call 941-330-0993. 25% off the "Ruler Safe"
Once again we offer the One Block Wonder class. This technique needs to be in your quilting repertoire. Take a print, a stripe, a large pattern, a panel, make 6 layers and cut wedges. If using a panel, it takes 7 pieces. One for the center and 6 to cut into hexagons. Presto! An abundance of hexagons to sew together. You control the color placement. No two turn out the same way. Finally when sewed, we show you how to add a border to the quilt, not an easy task with so many pieces on the bias. For your convenience we pulled several bolts that would make good one block wonder quilts when cut up. Class fee includes book, instructions, 60-degree ruler, and 2 free open sewing dates to complete the project. 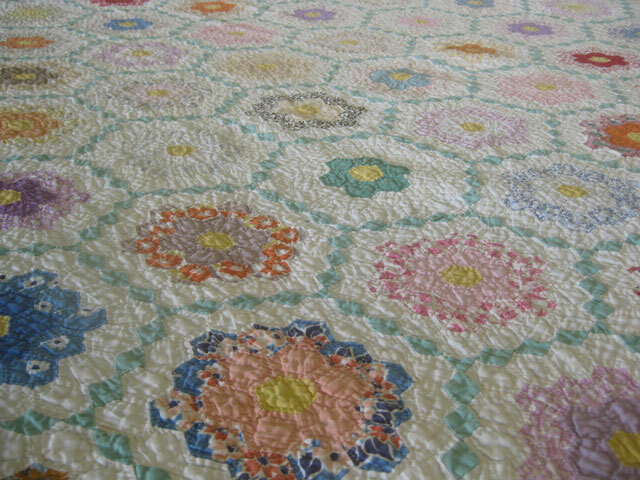 Get on FB and search for "One Block Wonder Quilt Forum" to see dozens of finished OBW quilts. Want to learn quilting techniques but don't know where to start? Let Faye guide you through the basic steps from fabric selection, reading a pattern, strip piecing, half square triangles, needle turn appliqué, how to apply borders, etc, using the Learning To Quilt book. 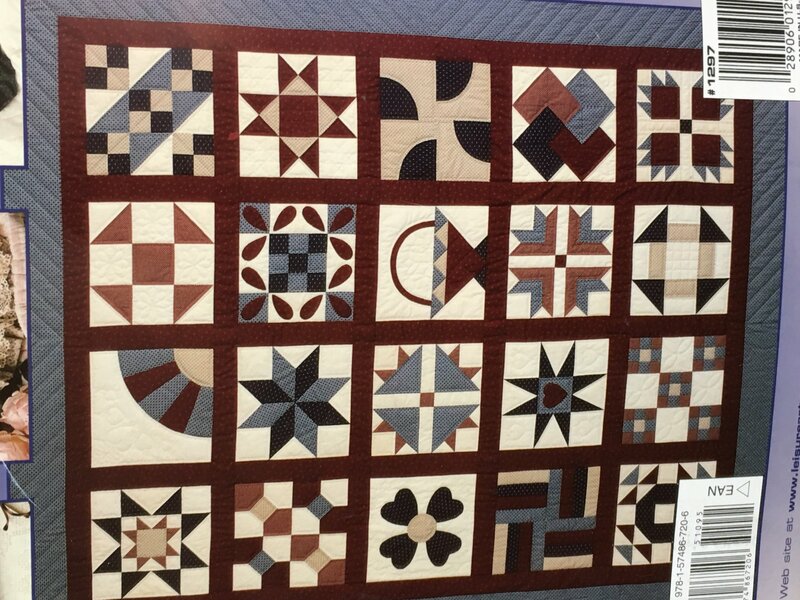 You will learn a new Block and technique each week, incorporating most of the basic techniques in quilt piecing. We are using the book in the above image, starting with the log cabin "rail fence." We start the class with 5 different blocks. For those who wish to continue, we will select 1-2 blocks each week, continuing throughout the book. Class fee includes basic quilting tools (rotary cutter, mat, ruler) patterns, instructions, and open sewing sessions to work on your project. Class kit packaged in a green "Alma Sue" bag which entitles customer to a forever 10% discount when shopping with the bag. A modern lone star. The pattern makes a 50 x 50 quilt. Easily turn it into a larger bed quilt by adding negative space around the pieced section with borders. The star uses one jelly roll. We made the sample with two Bali poppies from Hoffman. Choose your colors from a wide range of poppies. Pattern, fabric kit, and 45 degree ruler included in class fee. Kit is packaged in a green "Alma Sue" bag which entitles customer to a forever 10% discount when shopping with the bag. Beginning Sewing, How to use your sewing machine, T shirt quilt, Memory Quilt, Beginning Quilting, Finish a Project, Free Motion Quilting, or whatever your specific needs happen to be. Call 941-330-0993 to set a date and discuss your individual needs. Learn how to finish your own quilt instead of sending it out! Sample made in from two blue Bali poppy strip sets. Select your colors and background fabrics from a wide selection of bali poppies. Fee: $8 per session. No charge if you are finishing a project from one of our classes! Limited to 4 individuals. Please call 941-330-0993 to register! This is not the same as a private class, however, we will help you with the details of finishing your project. Our "seasoned" staff has a combined pool of more than 150 years of knowledge and experience in quilting. Duke is the applique and repair expert, Faye excels in free motion quilting and general quilt construction, Dawn is a master at paper piecing, Dena knows every aspect of deciphering patterns and making quilts, and Ella fills in the gaps, having worked on several thousand quilts over the last 17 years. This unique mix of knowledge and skills in one place is unusual and you get to tap into this repository at the Open Sewing sessions. Thursday sessions are akin to a quilt academy. 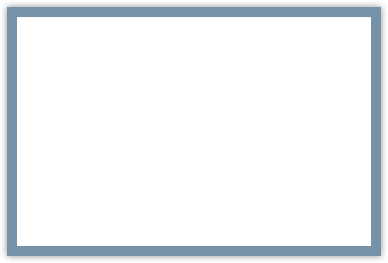 If this is your first time, please tell us what you are working on to make sure we can match your needs with a staff member. This session is not appropriate for someone who has never made a quilt or for someone who needs one-on-one instruction. Call 941-330-0993 for a Private Lesson. Check out our assortment of blenders. We make many Custom Quilts and use a lot of blenders! Stonehenge by Northcott, Dimples by Andover, Basic Backgrounds Tone on Tone in White, Neutral, Off White, Muslins, Timeless Treasures Fairy Frost. Love those Metallic Blenders! This website is for Information about the business. Monday is our day for packing, shipping, cleaning, quilting, sewing. Someone is in the store in case you need something or want to pick up your finished quilt. If there are cars in the parking lot, enter through the unlocked East door. Call 941-330-0993. Alma Sue's Quilt Shop offers a full line of QUILTING SERVICES. We design and make CUSTOM QUILTS. All work is done right here in our Sarasota store, in the PINECRAFT community amid displays of finished quilts. Visit us and watch accomplished quilters at work. Yes we have fabric from the major mills. We specialize in blenders and have in stock solids, backgrounds, wide backs, fairy frost, dimples, grunge, Northcott Toscana, as well as Florida and seaside prints. If you are looking for panels, we typically have about 75 in stock. Wide range of BATTING choices: Hobbs Heirloom blend in cotton, wool, silk, battalizer, synthetic, Quilters Dream in white, natural, and black colors. Let us help select the proper batting for your project. Our prices are significantly less than those found on internet sites. We carry batting NOT FOUND in chain stores. We will be in the shop, busy sewing samples, making quilts, and shipping internet orders. Please feel free to join us if the lights are on. ENTER through the single door on the EAST side. The door where the golf cart and employee cars are parked. 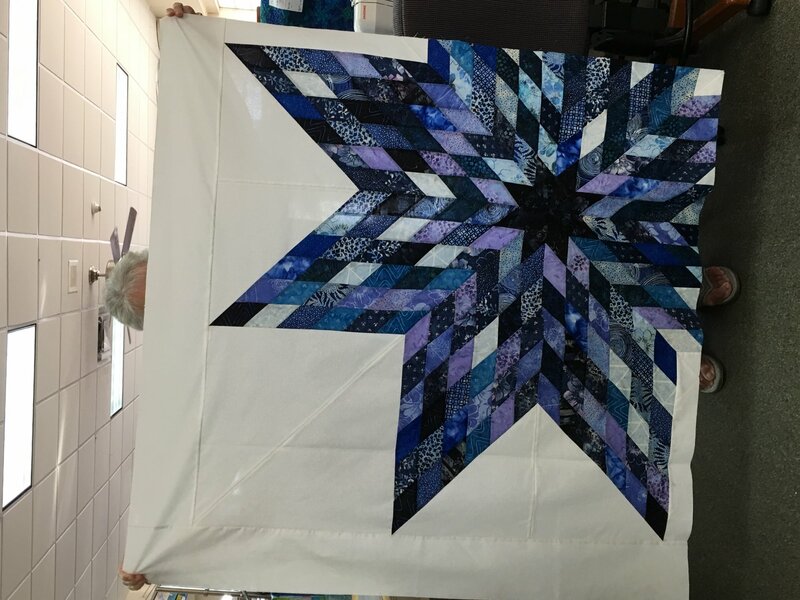 Check our Facebook page to see current quilts in the hand frame, new kits and new quilts tops made by us and our customers and upcoming classes. Search for "Alma Sue's Quilt Shop"
Quilts and other items FOR SALE can be seen and purchased at "AlmaSueShop.com." February 8, 2019 - Anniversary Sale Ongoing! January 24, 2019 - wideback sale! December 27, 2017 - Out with 2017! May 17, 2011 - Threads, page 2. NOTE: $40 up charge for seaming minky! $40 up charge to load and quilt minky! DO NOT BASTE layers together. Each layer is loaded onto frame separately. Batting: Choose from our wide selection of AMERICAN MADE batting. No batting with scrim, no batting with adhesives. Our machine will not produce a good quality stitch with these fillers. Available on THURSDAY. Fee is $8. Please respect our time and call 941-330-0993 for an appointment. and cannot state a value for your quilt. To find a quilt appraiser: GOOGLE "Quilt Appraiser Sarasota"